VARD is committed to reduce avoidable blindness by the year 2020. 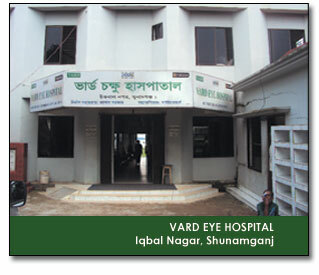 It has established two modern Eye Hospitals with 50-bed capacity in Elashpur, Osmani Nagar, Balaganj of Sylhet and 63-bed capacity in Iqbal Nagar of Shunamganj. 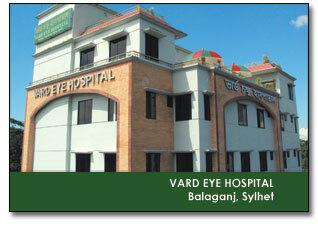 These hospitals are staffed predominantly by specialist surgeons, doctors and nurses and are well equipped with all modern equipment to perform cataract surgery implanting Intra Ocular Lens (IOL) using Small Incision Cataract Surgery (SICS) and Phaco surgery, detection of early childhood blindness and pediatric Cataract Surgery through referral and minor and major surgery with special care. Beside these, Dacryo Cysto Rhinostomy ( DCR), Dacryo Cystectomy (DCT), Glaucoma surgery, Excision of Pterygium, Abscess drainage, etc. are performed by experienced and expert doctors. Free Small Incision Cataract Surgery by using Inter Ocular Lens for Curable blind. Phaco is a revolutionary invention of Cataract Surgery. Every year many people are getting back their vision by this simple surgery. A small opening (2.2-3.2 mm) is done in the Eye to remove it’s internal lens by emulsifying with a pen-tip sized handpiece and a new artificial lens is replaced. It only takes 10 to 15 minutes to complete the whole surgery. After operation eye look normal since it is a stitch-less and pain-less operation. In most cases patients get back their vision just after one day of the surgery. Patients get cured very fast and can join work from next day. Smaller incision, hence lesser complications related to the incision size. Soft Acrysof Foldable lenses are used, which is easier to insert in the eye. Lesser possibility of infection due to smaller incision. Lenses used for the surgery protects from the ultra-violet ray. Designed and Developed by: Safia's.